A reported by TrekMovie and io9, the latest issue of a magazine called WIRED, which was guest edited by J.J. Abrams, features a new six-page Star Trek comic "When Worlds Collide", a biography of Spock leading up to the new film. 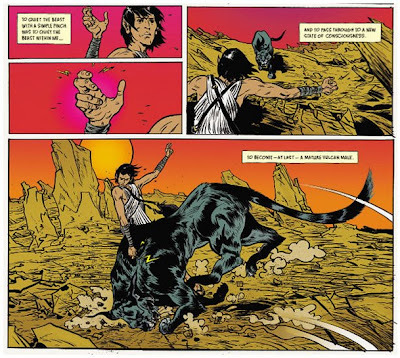 It was written by the film's writers Roberto Orci and Alex Kurtzman, with art by Paul Pope. Both reports have excerpts from the comic. I find myself (looking on ebay for a way to get this in the UK) and very curious as to how this sort of publication works along side IDW have the TOS comics license.